How To Make Sonoran Style Hot Dogs At Home. AZHotdog Of Phoenix Tells You How To Make Sonoran Style Hot Dogs At Home. And now the moment so many of you have been waiting for. Since people from around the nation keep emailing, let's tell you how to make the Sonoran Style hot dog at home. Get yourself a premium all-beef hot dog like the Hoffy franks we use and get yourself some bacon. Get all that other stuff like the buns, pinto beans, tomatoes, onions, salsa, cheese and jalapenos. Carefully wrap the raw bacon around the hot dog in a spiral from one end to the other of the hot dog. Try and cover the whole dog from end to end completely with bacon. You can use tooth-picks to hold the bacon in place. If you have a grill, grill them until your bacon is light brown. Try not to make your bacon too crunchy, you will have plenty of texture. No grill? No problem. Heat up the oven to a nice 350 degrees while you place the wrapped dogs in a baking pan or sheet or whatever, don't stack them, just lay down a single layer and bake them until that bacon is browning and just a bit crispy. While you are waiting, do all of your cold prep then go ahead and heat up your pinto beans. You want them hot so the cold foods don't cool down the hot dog immediately. Because now you are theoretically ready to assemble the final product. Let's get ready to ASSEMBLE!!!! WOOO-HOOOO!!!! Sorry. Excuse me. I like assembly. A hot dog vendor always makes a big show out of assembly and presentation. Or a bit presentation out of assembly and show. Whatever. Let's do this thing. Grab your steamed bun and put a good layer of pinto beans down first. Don't be stingy with the beans, that's half the entrée along with the dog, the rest is toppings. Now put down your lovely and artistically wrapped sausage. Take a picture at this point because we're about to cover it up where nobody will be able to see it. Which is rather a shame from a presentation standpoint but no time to cry, we gotta serve. The cheese goes right on top of this so it begins to warm and soften on the hot stuff. I use grated Jack cheese. It's flavourful but not overpowering. The other flavours are here to neutralize and balance what is currently a massive protein bomb. Then I like to put down the chopped tomatoes and the salsa right on top of that because all they will see by the time you are done is the red underneath the white chopped onions which ride on top, so this is most of the presentation. Now it is also authentic to rest a single whole jalapeno pepper on the very top of all, but most folks can't handle a whole jalapeno. I make that optional. But in terms of presentation, it really looks nice. You end up with something close to the colors of the Mexican flag that way. But whichever way, a Sonoran Style should look pretty heaped up. Don't skimp on the fixins! Make sure you assemble and serve the Sonoran Style IMMEDIATELY. Don't let them sit around on platters fully assembled, assemble them to order every time. For one thing, you want your dogs internal food temperature to stay 140 degrees or above and for another, with all those tomatoes and salsa, things are going to start getting soggy. That's about it. 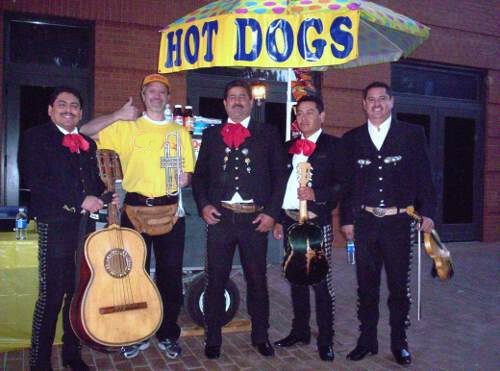 Serve Sonoran Style hot dogs with your favorite beer or soda pop, possibly while listening to a Mariachi band. Brace yourself, your mouth is about to explode in protein and tomato-salsa freshness. It's a good thing everything they said about meat and fats for the past 30 years has turned out to be so utterly and completely wrong. Enjoy this nearly-South-of-the-border delicacy with merry abandon! So that's how you make Sonoran Style at home. I'd include a picture but as I said, the heaping layers obscure everything below them so they look like a pile of tomato salsa with onions and a jalapeno on top. Email us with your thoughts on this regional culinary artform! Your well-articulated and incisive debate is welcome. There is some dispute about the breading and cheese here listed but this is a Mex-AZ thing. It goes right along with buying "taco shells" in the supermarket instead of tortillas. In Mexico, the food that comes in shells includes lobster and shrimp. Tacos come in tortillas. Sonoran Style hot dogs come in buns. Seriously, don't you think these guys know what a good Sonoran is? © 2007-2019 AZHotdog hot dog cart, All Rights Reserved. Phoenix Arizona's hot dog vendor of distinction. Serving Anthem, Apache Junction and Avondale. We're the best cart for your buck in Buckeye, Carefree, Cave Creek, Chandler, El Mirage and Fountain Hills. Our carts are seen in Gilbert, Glendale, Goodyear, Laveen and Litchfield Park. We're the cart for Maricopa, Mesa, Morristown, New River, Paradise Valley, Peoria, Phoenix, Queen Creek and Queen Valley. The cart of choice for Scottsdale, Sun City, Sun City West, Sun Lakes, Surprise, Tempe, Tolleson, Tonopah, Waddell and Wickenburg. What other hot dog cart vendor delivers so much to Phoenix?